Last night was the first race of the M-town series that Chris registered us for as part of my Mother's Day gift. I was really excited but a little hesitant about the Zoom through the Zoo. We've done it once before back in 2011 when I was pregnant with Cody (recap here) and I just remember how much I hurt after that race. Cody completely tore up my sciatic nerve with his pregnancy. I still have terrible flare ups and that race was the start of the problem. I was also nervous for Chris. After the Fairway 5K I had such a good time I asked him if he wanted to do the Zoom before we heard about the M-town Series. He told me no, he said he didn't think he'd be ready and I was fine with that. So I'm really thankful that he's such a trooper because he didn't complain at all when we found out the Zoom was the first race of the series and he still registered us for it because he knew I really wanted to do these races. We had a little hiccup getting child care but thankfully my friend Cam always pulls through when we are in a pinch. She lives close to the zoo so we were able to take them over there and have her watch them while we went and ran. Cam loves our kids to death so I feel like whenever I ask her to watch them I'm really doing her two favors, 1) I'm letting her spend time with my amazing children, and 2) it's the best form of birth control out there. HA! Just kidding. She said she had a good time with them, and the kids were elated to be with her so that's good. While we were waiting for the race to start we ran into some friends. 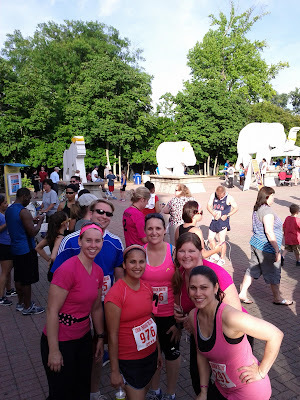 These girls were some of the lovely ladies I trained for the St. Jude half with. It was great to see them and chat with them. Speedy Abish and Bobbie finished long before Chris and I, but I was able to be there at the finish line to cheer for Lilly and Katie. So that was nice. 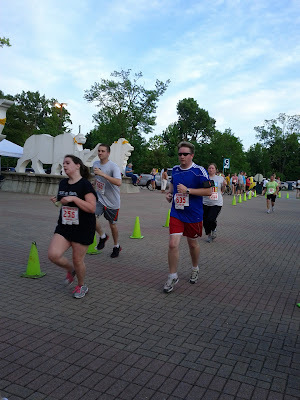 Alright, so the race takes you through part of the zoo (I'd say about 1.5 miles of it) and then shoots you out and you do the rest through Overton Park which is nice and shady. Most of the animals are put up for the night but there were a few out so that was nice to see and distract you a bit. 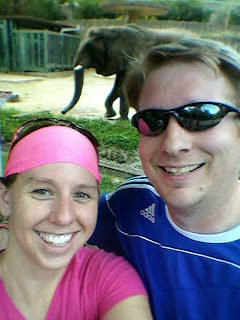 The elephant was really close so I asked Chris if he wanted to stop and take a picture. He told me no. Then he did it anyway. Gotta love that man! Plus it didn't hurt that the water was just up ahead so it was a good time to take a break and walk a bit. No idea why this picture is all stretched out. We look a little goofy in it. Chris had a bit of a hard time with this run. His side hurt a bunch and I'm not sure if it was from dehydration or just not breathing correctly. He looked pretty miserable through most of the race but didn't complain. I tried my best to be encouraging and motivating but near the last half mile I felt like he was getting annoyed at me and wanted to yell. So I decided it was in our best interest to avoid therapy and for me to boogie on ahead. I wanted to go ahead and get finished to take his picture coming in the home stretch. I've never been at the back of a race and still had energy! Now please don't read that the wrong way, I've been at the back of the race plenty of times, but I'm usually dragging and feel like death and want to murder the next person that says, "you're almost there!" But since the tri and how encouraging people were I decided I wanted to be like that in the races I did. So once I started be-bopping away from Chris I made it a point to tell others they were doing a good job. I told one group as we were running up a hill that they were doing great, it was almost over just up this hill and then down and we turn into the parking lot to the finish line. One girl yelled "thanks for the encouragement!" And that made me feel good, at least she didn't want to punch me. Then as I passed another two women one was really pushing the other I could tell it was their first race I told them, "only a quarter of a mile to go. It'll take about 3 minutes, you can do anything for 3 minutes." One yelled, "3 minutes how do you know." So I told them if they could keep my pace we'd be done in three minutes. One girl really tried, I glanced back a few times and she'd say, "we're still here" then one time she realized her friend wasn't and she stopped to walk with her. I cheered for them at the finish line as they came in and chatted with them a bit. They said they had a great time and were looking forward to other races. Finally as I turned into the home stretch I still had plenty of energy so I decided to sprint it out and sprint it hard. I think at one point I saw my Garmin say 6 something for my pace. Woah! It's funny cause coming in that hard and fast near the end of the race a few people were yelling, "Go 636! Give it that kick yea!" I'm sure they'd be less impressed if they realized I'd just walked most of the 4 miles. Ha! But I did finish ahead of Chris enough to come around and cheer for him as he crossed the finish line. I'm really proud of him. That's his first 4 miler. And really I'm proud of everyone who ran the race. I'm starting to get a new found appreciation for people who do these events. I've gone to these races focused on myself for the most part. I have a goal or a number in mind and I push myself really hard to get it and quite often I do but even then I don't feel proud. I would bet most of those people back there were running 4 miles probably for the first time. They had a plan and they stuck to it. They pushed themselves to do their best and a good majority of them were still smiling. I like people who smile while they run. I want to be that person. I'm going to make more of an effort to really smile and engage people while we run the rest of these together. It doesn't matter if you are a speedy person at the front, or a straggler at the back, organized races are supposed to be a fun celebration of what you are accomplishing wherever you are on your fitness journey. Here's to the Harbortown 5k in a few weeks! Fun! Did yall all decide to wear pink together? !